The concept album, "The Last DJ," is actually a broad indictment of American culture using the music business as a metaphor. It ends on a hopeful note, arguing that marketers and moneymen can't bottle what's in the heart. "I really have dedicated my entire life to this music -- not that I didn't want to, or even have a choice," said the 51-year-old Petty. "It overcame me at an early age in a big way, I care about it, and I don't want to see it reduced to a silly caricature. "Maybe that's what inspired me to write this album," he said. "I really care about this, and I don't want rock to become irrelevant." Petty is careful to deflate pretensions that often surround concept albums; he joked on the "Today" show this month that listeners could still "dance around the house naked" to the songs. But he says he's never seen a more vapid time in pop music. He became immersed in the topic and liked the challenge of writing a story that wove characters throughout the disc. Making it simply about the music business would be too easy. "It's more about the corporate America," he said. "There's a lack of truth in entertainment and a fading morality among all of us, man to man and woman to woman. I think the point I tried to make with the album is that the music is the redeemer in the end." The key lyric for Petty in the last one: "can't stop a man from dreaming." The song, "Can't Stop the Sun," envisions like-minded musicians joining him. Releasing the album's title cut as the first single was itself a challenge to the music industry: He's asking radio stations to play a song that says radio celebrates mediocrity and lacks the human touch. Angry when they first heard it, programmers at New York's influential WAXQ radio tossed the song aside. "My first reaction was, 'What is this guy doing?'" said Eric Wellmen, the station's music director. "How can he expect us to put a song on the air that basically says we're (junk)?" But Petty and his record company worked them. They explained the album's concept, and Petty recorded a spoken intro for "The Last DJ" specifically for WAXQ. The station's listeners were given passes to see a concert performance of the album in theaters on closed circuit television. WAXQ eventually added "The Last DJ" to its playlist. "It's probably the best thing he's done in a long time," Wellman said. "For us not to put it out there when he is one of our core artists -- we had to find a way to do it. And with his help, we could." A handful of stations across country passed on the record, but enough are playing it to make it a hit on the heritage rock charts, said Sean Ross, group editor for Airplay Monitor Magazine. Radio stations that won't play The Last DJ fascinate him, Petty said, because "I've never heard a more pro-radio song in my life. I think that just illustrates my point. There are no naughty words in it. That just shows that they're afraid of an idea." 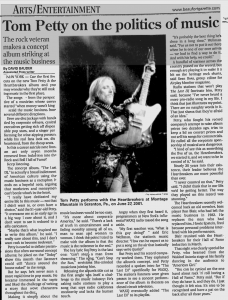 Petty, who fought his record company's attempt to raise album prices two decades ago, tries to keep a lid on concert prices and not sell his songs for commercials. He called all the corporate sponsorship of musical acts dangerous. "I kind of see this as something the five of us, the Heartbreakers, we started it, and we want to be in control of it," he said. Nearly 30 years into their existence, their leader believes the Heartbreakers are more powerful than ever. "I never counted on that," Petty said. "I didn't think that in our 50s we'd be getting better. The way they played on this record was stunning." The Heartbreakers recently welcomed back an old member, bass player Ron Blair, who had left the music business in 1982. He replaces the man who had replaced him, Howie Epstein, fired because personal problems interfered with his performances. Blair reunited with the Heartbreakers for their Hall of Fame induction in March. That night was clearly special for Petty, who beamed from the Waldorf Astoria stage at his family dancing in the audience to "American Girl." "You can be cynical on the one hand about rock 'n' roll having a Hall of Fame," Petty said. "But if they do have it, and they do, I just thought it felt nice. It's nice to be recognized and have a pat on the back after all these years."